Eating healthy food from an early age instils good habits and sets your kids up with the nutrients they need to develop both physically and mentally. However, with fast food and sugary snacks and drinks so readily available, busy teenagers might see cooking as too much of an effort. Inspiring your teens to cook will help them to nurture their independence and ability to create nutritionally balanced meals when they move away from home. Here are five tips to get them cooking, so that they are kitchen-competent before they fly the nest. Encourage your teens to cook a meal for the family. Ask them what they fancy having for dinner and let them find recipes that they might like to try – but make sure they’re doable. Dishes that can be prepared in around 30 minutes and involve only basic utensils or techniques will offer an almost instant sense of satisfaction. Help them gather the ingredients and cooking equipment they will need for the meal they have decided to cook for everyone. This takes away the panic of rummaging around for the small saucepan when they need to be making sure that they don’t burn the rest of the food. Put them in charge of the food shopping and let them choose ingredients they might want to add to the meal. When it comes to preparing the dinner, give them some guidance before starting, but try not to interfere too much and take over. This will relieve the pressure of being watched and make it their own project rather than yours. Positive reinforcement is important to anyone trying to learn something new. This will give your teens a confidence boost in their cooking abilities and in themselves. Either whilst eating the food or after, tell them what you liked about it and encourage them to share their thoughts on the food and cooking experience. To nurture their enthusiasm, ask if they want to try out a cookery course. A dedicated teen cooking class will help them develop their skills and learn tips and tricks alongside other people their age. 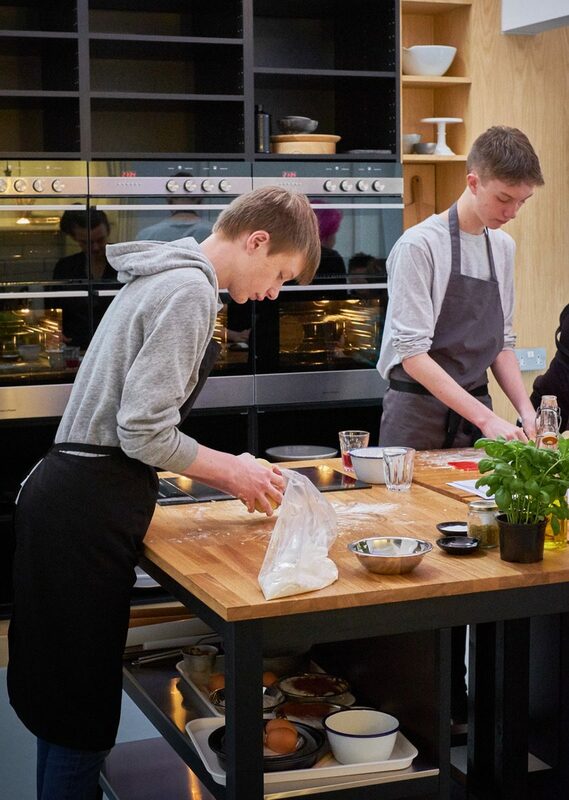 We run courses exclusively for teenagers at our cookery school in Cheadle Hulme, Manchester. They promote healthy eating to the younger generations while teaching them useful techniques that prove creating mouth-watering dishes can be an enjoyable experience. We cover both main courses and desserts in a fun, engaging environment after school – and offer flexible booking options too. If you have any questions, get in touch on 0161 282 2050 or email us at office@atthekitchen.co.uk. Previous PostPrevious Lights, Camera , wheres the photographer gone…..